What did I accomplish in 2015? Have We Lost the Ability to Appreciate Art Museums? On Cawmet! On cupid! On, Dahnder and Blitzen! And the smoke circled his head, arahn like a wreef. The story of the Three Little Pigs as told in Pittsburghese. I have been writing for local newspapers, blogs, comics and so forth for a few years now. Writing comes pretty naturally to me. It is just my rambling, blathering, rants typed out instead of shouting these things on a street corner. If I did share my musings via a soapbox and not a blog I would rightfully be locked up. This is my way of saying I am a writer and all writers are one street corner rant from ending up on a Secret Service list somewhere. So it is appropriate that one of Pittsburgh’s brightest bloggers, J.J. Hensley is himself a former Special Agent with the Secret Service. You might be expecting his blog to be filled with pieces on the inner workings of the Illuminati, government cover-ups about UFOs, and the well-guarded secret Coca Cola formula. Alas he doesn’t tackle any of these great mysteries. He instead explores a much deeper one- How to write a novel. While he does sometimes delve into the topics of security and strangely Playdoh, his posts on the writing process really standout. I view writing a novel like I view building a bridge. I am pretty sure I know how to do it, but really have no idea where you start? -Either end? The middle? Do you build it first and then haul it into place? No idea. J.J., who is an award-winning mystery writer, takes the mystery out of writing. His posts are informative and entertaining. After reading his posts you feel empowered with the ability to write rather than rant on a street corner. While he may not teach you how to build a bridge he will teach you how to bridge the gap between day-to-day writing and writing a novel. I am almost out of literary puns so I will end with declaring him the winner of “The Most NOVEL Blog” award. See what I did there. The amazing Harry Albacker and the great paint hoax! He was a natural born showman. He once claimed to be P.T. Barnum reincarnated, he said the same of Houdini. 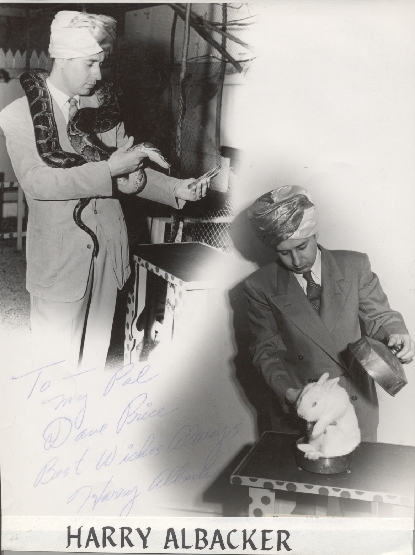 He claimed to have been born the day Houdini died, a story he manufactured to add to the illusion of his life on stage. He was known for handing out the rabbits he used in his shows, he once gave a rabbit to Caroline Kennedy on her birthday. The rabbit had a taste for beer, and could supposedly play the trumpet, according to Harry. The rabbit was removed from the White House and donated to the Washington Zoo, apparently drunken rabbits were not considered a proper pet for a the young daughter of JFK. Of his many pets over the years several of them made headlines. His guinea pig escaped during a visit in North Carolina. When he was found six days later he was flown back to Pittsburgh. A thief caught a nasty surprise when he stole Harry’s suitcase and discovered a sixty pound python. His rooster Big Daddy wandered off, Donald the duck flew away, and many rabbits vanished. Luckily they always seemed to make more rabbits. He “gave up magic” in 1949 when he discovered a formula for polka dot paint. 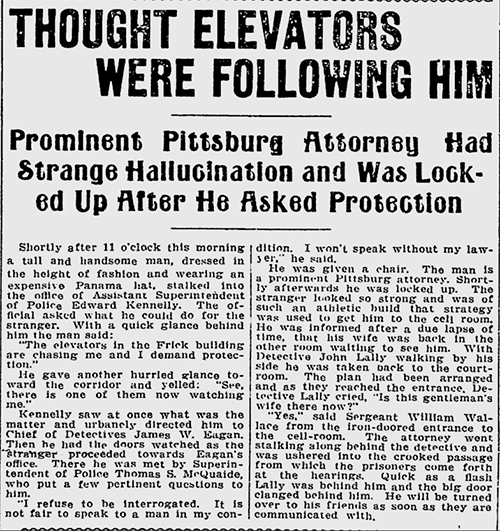 News spread throughout the United States of his “discovery.” He rented the parlor at the Fort Pitt Hotel and invited the press and representatives of the paint industry. He demonstrated his remarkable paint and the audience was stunned! It was of course an illusion but newspapers ran the story and soon stores where getting calls asking how they could buy the polka dotted paint. It was of course just another of his magic tricks. The papers got back at him when they ran the story of Harry getting locked out of his dressing room! He’s no Houdini they declared. When the work at nightclubs dried up Harry began to take work performing for children. At first he thought it would be degrading, but he soon fell in love with the crowds. He would entertain Pittsburgh children for decades at festivals, libraries and on TV. He became a Pittsburgh icon. Harry passed away while performing on stage at Pittsburgh senior citizens center in 1994. It was a heck of an exit for a great showman! Joseph F. Haller was an inventor who held several patents. His inventions included a fruit washing machine, an automated bottle washer and other mass production machines for the bottling industry. He had worked for Heinz for several years designing improvements to the manufacturing process. He began inventing when he was just 14 years old when he built his own bicycle. 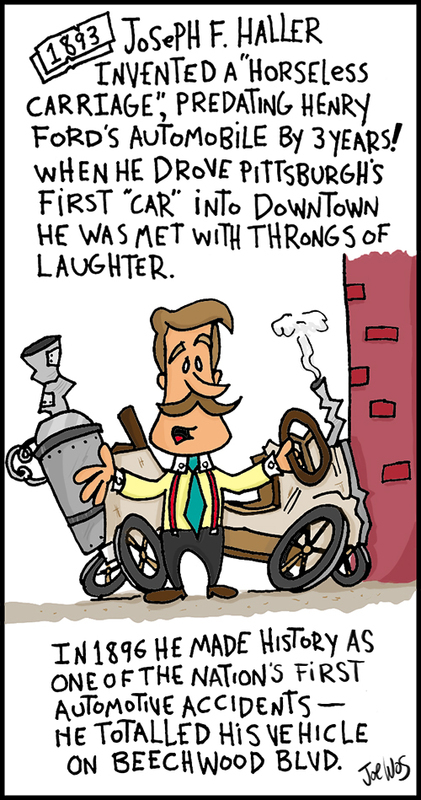 In the early 1900’s he began tinkering with an idea for a “horseless carriage”. While his design was not the first, it was the first in Pittsburgh, and one of the earliest, predating Henry Ford’s first vehicle design by 3 years. When Haller drove into downtown Pittsburgh he was met with howls of laughter. His own father thought it was a worthless contraption and would never replace horse and wagons. In 1896 the car tipped over onto the newly laid out Beechwood Blvd, causing one of the first automobile accident in US History. Luckily no other cars were involved in the accident…because there weren’t any. He passed away in 1944 and is buried in St. Martin’s Cemetery in Pittsburgh. 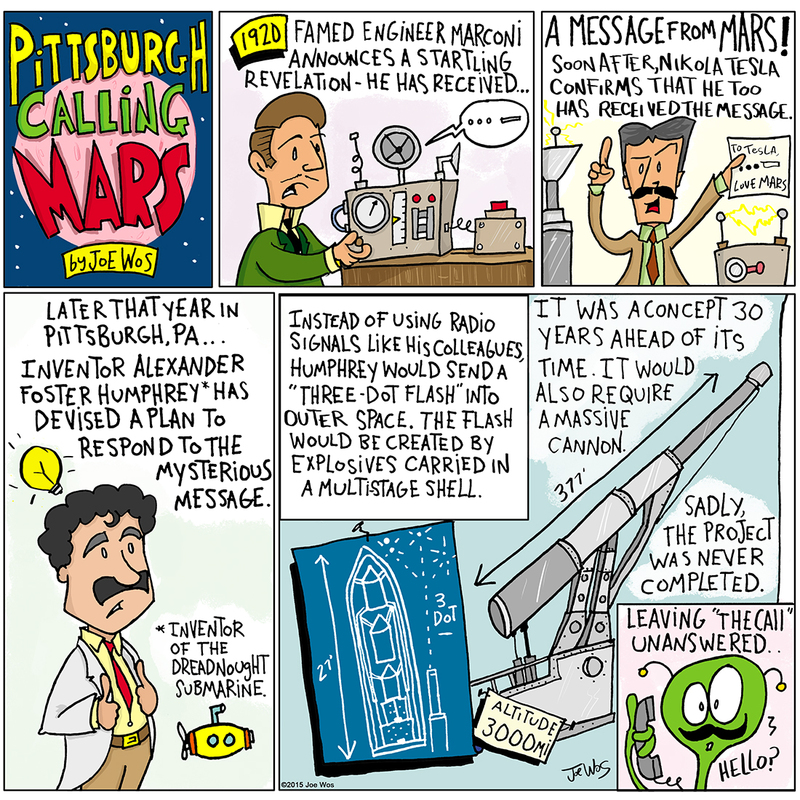 Pittsburgh Calling Mars! 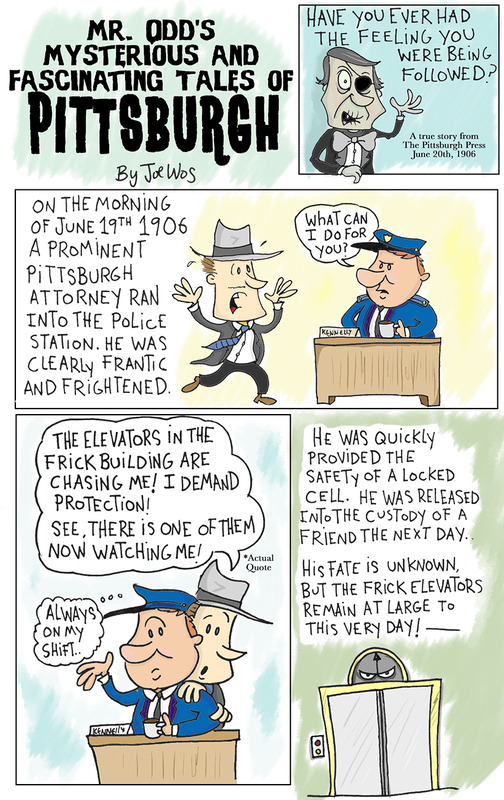 A BurghBlog Comic by Joe Wos. Forgotten Yinzers Series.